David W. St. John, P.E. Mr. Power has been a consulting engineer throughout his professional career since graduating from Purdue University. Trained as an electrical engineer, he has designed quality power, lighting, fire alarm, and telecommunication systems for new and renovated higher education, governmental, advanced manufacturing, and healthcare facilities. 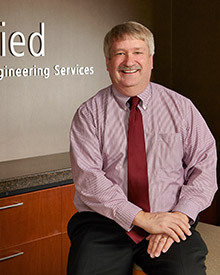 As President of Applied Engineering, Mr. Power oversees the day-to-day operations of the firm. He also serves in the role of principal-in-charge and project manager on projects, and continues to have a hand in the engineering, especially on larger and more complex projects. His leadership includes the overall coordination and knowledge of the scope of other team members, including those in other fields such as mechanical, civil, and structural engineering, architects, and other professional consultants. His primary professional goal is to provide the best engineering solutions possible to meet the client’s needs and wants, all with a careful eye on their goals, budget, and schedule. Currently Mr. Power serves some of Applied’s largest higher education, governmental, and advanced manufacturing clients. He also works with his partners in client and business development.